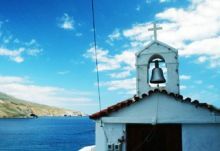 Greece is situated at the most southeastern part of Europe on the southern Balkan Peninsula and include numerous islands in the Mediterranean, Aegean, and Ionian seas. Settled by Achaeans, Aeolians, Ionians, Minoans, and Dorians by 1000 B.C., the region grew as an amalgam of independent city-states, many of which established colonies throughout the Mediterranean by the eighth century B.C. Classical Greek culture, centered around Athens, reached a high point in the fifth century B.C. before being conquered by Philip II of Macedon in 338 B.C. The area was later controlled by the Roman and Byzantine empires before being absorbed into the Ottoman empire (1456). In 1821, Greece gained its independence and established a constitutional monarchy. The king was deposed following a military coup in April 21st 1967, and a democratic republic was established in 1974. Athens is the capital and the largest city. Population: 11,000,000. It really all did start here. The seat of democracy. The history and the culture is so rich you will never get bored or tired of learning and being amazed. Athens is a must during the summer but it is also becoming a very popular winter destination as the climate is excellent and there is lots to do and see. English is spoken by the vast majority of the local inhabitants, who are very helpful and warm. Crime rate in Athens is the lowest in the whole of Europe. You see few policemen and you can feel free and safe at all times. That is not to say some things do not happen - they do, but rarely do they involve the Greek people who are honest and very friendly. Actually the only crime to worry about is pick-pockets. The climate in Greece is typical of the Mediterranean climate: mild and rainy winters, relatively warm and dry summers and, generally, extended periods of sunshine throughout most of the year. A great variety of climate subtypes, always within the Mediterranean climate frame, are encountered in several regions of Greece. This is due to the influence of topography (great mountain chains along the central part and other mountainous bodies) on the air masses coming from the moisture sources of the central Mediterranean Sea. Thus, the weather in Greece varies from the dry climate of Attiki (Athens’ greater area) and Eastern Greece in general, to the wet climate of Northern and Western Greece. Temperatures December – March 10/19 deg C, April -May 12/22 deg C, June -September 28/40 degC . If you arrive in Greece by air then the Eleftherios Venizelos airport is where you come in and leave from, especially if you are on long haul flights. 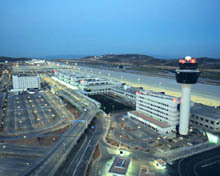 The new Athens airport is simply terrific and a great pleasure for a change. Getting in the city center from the airport can be done by private transfer with an English speaking driver, or by street taxi, bus and the new metro. Athens is also the starting point for many of the mainland tours to Delphi, Meteora, Olympia, Ancient Corinth, Nafplion, Mycenae and many others. If you arrive by sea then the port of Piraeus is where you come in and leave from. Your ship docks in either terminal A or terminal B and you have the same options as above in order to get to the city center. If you are wondering when is the best time to come to Greece.. any time of the year is the answer. The tourist season lasts from April to November, peaking in August. In general, the best months are April, May, June, September, October and November. Winter holidays in Greece is also an excellent option. In winter you can enjoy the city and the country side without the many tourists who traditionally visit in the summer. Everything really! Acropolis is the top favourite, but this is best done in the morning so as to avoid the beat of the heat and the crowd. If this is your first time in Athens I highly recommend the half or full day Athens tour. Visiting Cape Sounion is very nice but you will spend 3 hours in the car because it is 68 Km each way. In the mainland it is worthy to visit Ancient Corinth, Mycenea, Nafplion, The Theater of Epidaurus, Delphi, Olympia and Meteora. There is a huge choice for you. Since the entire city was basically overhauled and fabulously improved for the Olympic Games in 2004, you can now reap the benefit of the hotels which have raised their standards dramatically. For hotels in Athens please contact Anthony at: anthony@antelopetravel.gr In my opinion the best location to stay are Plaka, Syntagma Square, and Acropolis area. For the overnight stay(s) outside Athens you can either book the hotel(s) on your own or I can book it/them for you (within your budget range, of course). The hotel(s) that I recommend is/are family owned, clean and not very expensive. You can year whatever you like. Casual is normal. If visiting a religious place of worship you will need to be guided on attire, but generally speaking even there, there is no problem. Evening in the summer periods is always very attractive, and the local ladies do lead the way in being beautiful and expressive, especially if going for dinner, night club or disco. *Students from countries outside the E.U.